In the words of tennis champion Arthur Ashe, "From what we get, we can make a living; what we give, however, makes a life." The 1968 graduate of Denbigh High School attended Virginia State University where he began pursuing a degree in medicine. That was until the fateful day when he caught an episode of The Undersea World of Jacques Cousteau—a television series following the scientific expeditions of renowned sea explorer Jacques Cousteau and his crew aboard the Calypso. From that moment on, Hedgepeth knew he wanted to pursue marine science. On graduation, Hedgepeth knew his days in the lab were behind him. He served as Marine Science Coordinator at the Math and Science Center in Richmond before realizing that his real passion was to share what he had learned about the ocean with young people. With a sincere passion for his students and the subjects he teaches, Hedgepeth also takes pride in his second career as a professional tennis player. 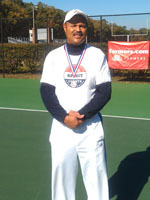 A certified tennis instructor since 1988, Hedgepeth still plays competitively, and was once ranked as the third best tennis player in the state of Virginia for his age group. While juggling two careers, there isn’t ample time for Hedgepeth to come to VIMS to visit old friends. However, each year he brings his students to the Gloucester Point campus to learn about his alma mater, and the groundbreaking research happening so close to home. This year, he plans to take his class to the VIMS Eastern Shore Lab in Wachapreague to give them an even broader perspective on what VIMS is all about. The first African American to graduate from VIMS’ graduate program, Hedgepeth is an accomplished science teacher, successful tennis professional, avid bass fisherman, husband, and father. “The satisfaction I’ve gotten from doing what I do for so many years—and still having a passion for it—is my biggest accomplishment,” he says. The influence Ashe and Cousteau had in shaping Hedgepeth’s career is apparent. 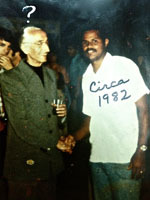 Though he never had the opportunity to meet Ashe in person, he was able to meet Cousteau—during a tour of the Calypso no less—at Norfolk’s Harborfest in 1982. To this day, a photo of him shaking the Captain’s hand decorates his desk at HRA.